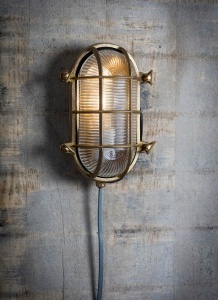 Inspired by lighting found on naval ships, the Devonport Bulk Head Light is vintage and iconic in style. The oval shaping with ribbed glass design offers a stunning expanse of light to your surroundings. The fitting could be positioned next to a doorway, spaced around the exterior of the home or in the potting shed giving you that much needed light.